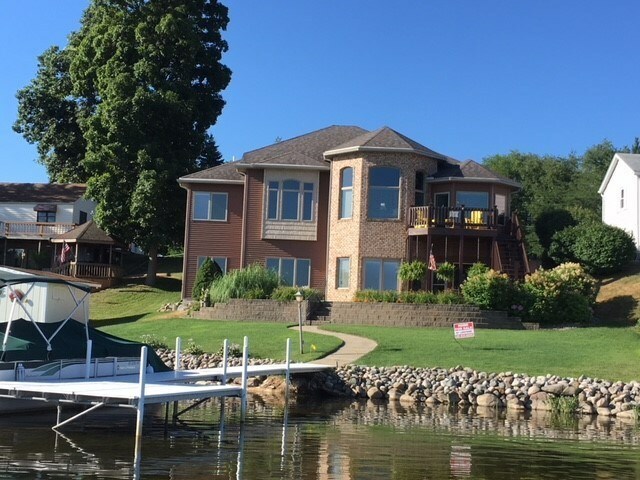 Beautiful custom built home with panoramic views of Jimmerson Lake. 80 feet of frontage on the Lake James Chain, plenty of parking and conveniently located just a short walk from the Four Corners area. Some of the best food, donuts & entertainment are just down the street. Built in 2003 by the current owners this home features 3 bedrooms, 2.5 baths & character from columns to tray & vaulted ceilings, designer ceiling fans, a stately foyer entry & more like 2 fireplaces, whole house generator. Lakeside windows allow the natural light to just flow. Formal dining room adjacent to kitchen & lakeside eating area that opens up to a lakeside deck. Kitchen has a breakfast bar, tile backsplash and stainless steel appliances. Main floor master suite, laundry & half bath. The walkout basement has 2 bedrooms, large family room and spacious wet bar/2nd kitchen area. PLUS a massive 29x20 storage room w/9ft ceilings & laundry that could be finished off for additional living space. Screened porch, lakeside patio, attached 3 car garage plus 2 backlots for additional entertaining or parking.